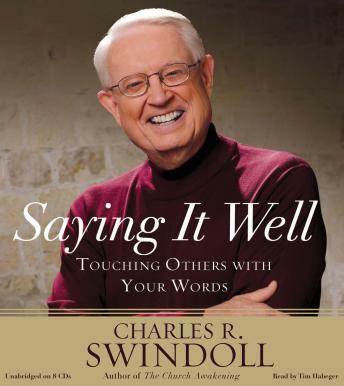 Bestselling author and master communicator Charles Swindoll has been effectively speaking to others for over fifty years. In SAYING IT WELL: Touching Others With Your Words he shares his secrets on how to talk so people will listen. Filled with techniques, stories, and models that clearly explain the formulas for successful speaking, Swindoll teaches readers the foundational principles for how to communicate, from preparing for a speech, organizing thoughts, and filtering out the superfluous to overcoming fears, grabbing the listener's attention, and knowing how and when to stop. With humorous stories and inventive, practical tips, one of America's premier communicators shares decades of experience on how to speak with authority in every situation, persuade others to consider the reader's perspective, overcome the reader's fears of public speaking, and love others more effectively with the reader's words. He also shares his personal story and the journey to becoming a world-famous speaker.